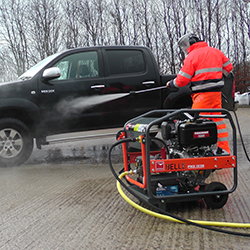 Heavy-duty, robust, PWX professional range of cold water, high-pressure, high-flow Pressure Washers. Designed specifically for demanding rental and hire applications. Robust, compact full Engine & Pump protection frame complete with hose storage facility as standard. 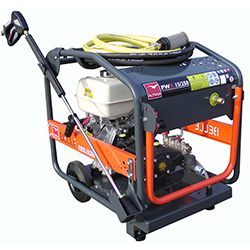 Professional Honda petrol and Yanmar Diesel engine options with recoil start. Detergent / chemical feed-line complete with strainer filter. Single point lift to minimize manual handling risk. Folding and lockable transport handle. Inlet-line strainer for added pump protection. High quality, heavy-duty triple piston pump. Professional two-wire, 10m braided hose, complete with quick-screw adapters and swivel couplings. Lance holder integrated into protection frame. Lance comes complete with safety trigger lock. Specifically designed for hire and rental markets.